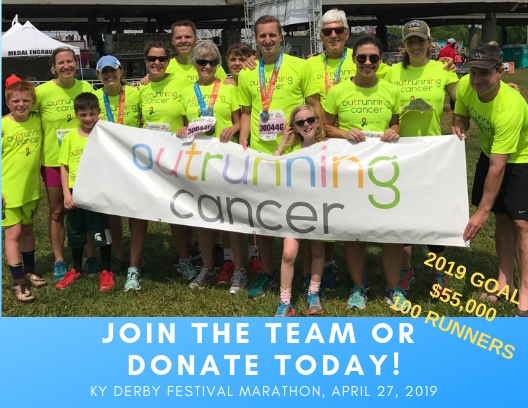 On April 25th the 2nd annual Hope Scarves Outrunning Cancer team successfully completed the Kentucky Derby Festival Marathon, miniMarathon or Marathon Relay. We kicked off the weekend by celebrating with over 200 friends and family at our Pre-race Pasta Dinner at Big Spring Country Club on Friday evening. We shared many laughs, met new team members and talked race day logistics. Race day was an amazing day all around! 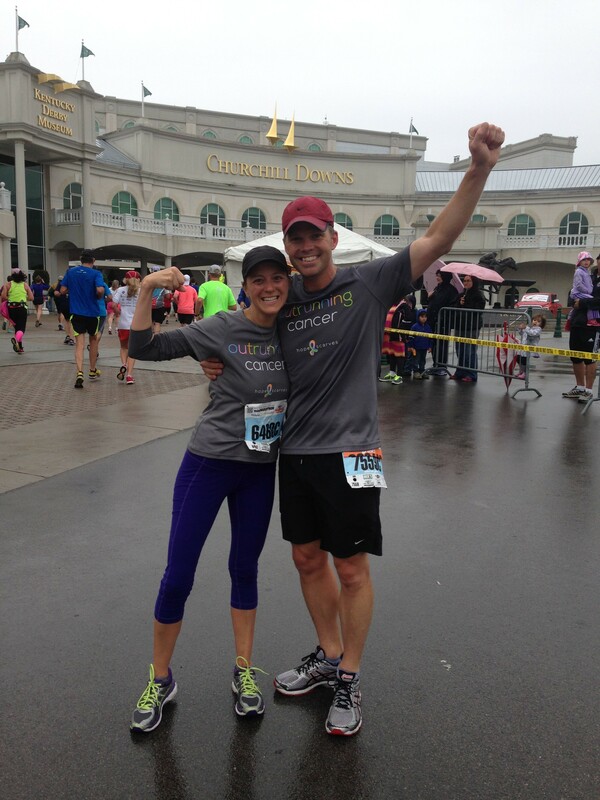 We had 160 runners on our team – joining together on a cold and rainy day in Louisville to support Hope Scarves. The weather didn’t dampen our determination or the fun. We ran to support our mission, to support friends or family who have struggled with this disease, and some ran recently having faced cancer themselves. Together, with the help of our supporters, we raised over $60,000 – doubling our donations from last year! We wrapped up the memorable day at a post-race celebration held at Gerstle’s Place in Louisville. We danced and laughed the night away, celebrating our achievements and living life to the fullest! There are many more miles to go before a cure but that weekend we did our part to Outrun Cancer! Today is filled with emotion. Ten years ago today my husband and I became parents. And, life was never the same. As we celebrate Wills 10th birthday I am overwhelmed with the joy of being his mom. I am also very aware of those for which being a parent isn’t possible. I am so thankful to feel well enough to celebrate with him today and every day. This weekend we took he and his team to the Louisville City soccer game, yesterday we made his favorite dinner (burritos), this morning we made him breakfast in bed then I went to my monthly treatment with two dear friends. 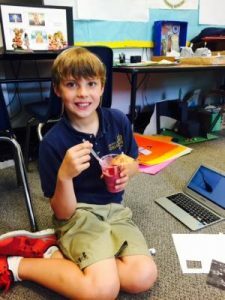 This afternoon Jay and I brought our smoothie maker to school to make his class fruit smoothies! Complete with umbrellas. Tonight we will cheer him on for a birthday win (hopefully) on the soccer field. Every year on our children’s birthday I tell them the story of the day they were born. Wills was breech and we had no idea! (so much for the natural childbirth we were planning… so quickly the way he got here didn’t matter but just that he was safe). As I was running around today getting miniature umbrellas a dear friend with Metastatic Breast Cancer is breathing her last breaths in the loving care of Hospice. I carry the sorrow of her family close to my heart. As I hug my son I think about the fact that my friend won’t be there for her children at their next birthday. The heart wrenching reality of this awful diagnosis. I am thinking both about birthdays and deathdays. Then I get really angry that my reality points toward such morbid thoughts. But, I have several friends living in the “alternative reality of advanced cancer” and it makes me so very angry that there are not more options for them. I am aware of how fortunate I am today to be worried about miniature umbrellas. Life is derailed with cancer and ultimately destroyed for so many living with advanced disease. I don’t have profound thoughts about end of life. I am in awe of my friend whose deep faith enables her and her family to rest in peace as her body weakens. Right now, today, as I celebrate my sons birthday. I am more angry than anything that there is nothing else we can do to help her. I am really just in such disbelief. I am reminded about how thin the line is between celebrating birthdays and facing death for those living with advanced cancer. I know how much she would love to care, for just one more day, about mini umbrellas. So today I celebrate Wills’ birthday and the lives of all those living and dying. I am reminded today how precious and fragile this life is. Celebrate and be grateful. Live with intention and gratitude. That is my birthday wish for my sweet 10 year old and all of us. This is my mantra as I take a deep breath, hold my head up and walk up to the carpool line. Balancing on this fine line. Live each day with intention, joy and gratitude. Life is fragile. I find comfort in the simple common shared reflection on life and birthdays. She lived a beautiful life and I am determined to carry her determination to face this disease within me. Please pray and hold wendie and her family In your heart and prayers.